Investment Incentives of the ZED Mariel: Will Foreign Investors Take the Bait? The aim of this paper is to describe and analyze, in a comparative framework, the set of investment incentives that Cuba offers foreign investors that locate in the ZEDM. The paper discusses briefly the historical development of export processing zones or similar entities to attract foreign investment globally and then Cuba’s prior experiences with such efforts. It concludes with some observations about the ZEDM in the context of similar arrangements in the Caribbean and Central America. Export processing zones (EPZs) are enclaves within a national customs territory into which foreign capital goods, components and materials can be brought in duty-free.3 Host governments generally grant fiscal and other incentives to companies that locate in these enclaves. Imported components and materials are processed within EPZs — typically, they are assembled into a finished product — and then exported. Custom duties are not assessed on the imported components unless the finished product enters the national customs territory of the host country (i.e., the good is consumed within the host economy). 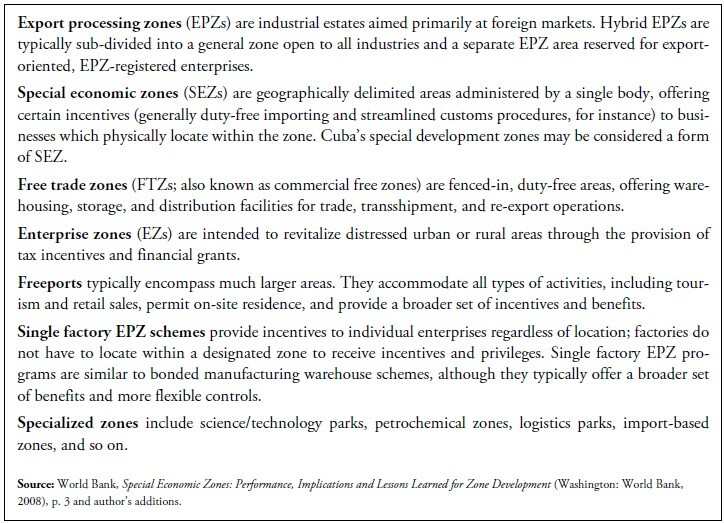 The basic premises underlying EPZs, namely duty-free importation of equipment and materials and a variety of incentives to attract foreign investors, are also present in other forms of export-oriented activities with different names (see Box 1) that are not necessarily located in an enclave industrial park, special economic zone or customs in-bond territory. Among the earliest, and most developed, forms of EPZs in the Western Hemisphere are the Mexican maquiladoras, established in that country beginning in 1965 within a 20-kilometer strip along the Mexico-United States border. Plants established within this geographic zone could import in-bond (i.e., without paying duty) foreign-made components or metal products to be assembled or further processed in Mexico and then exported (typically to the United States). Similarly, imported machinery, equipment, raw materials, replacement parts, tools and accessories used by these plants in production for export were subject to temporary duty-free entry. In the early 1970s, Mexico relaxed the restriction that maquiladoras locate in the U.S. border region in the interest of development of other regions of the nation, although maquiladoras still concentrate near the U.S. border. In the late 1960s and early 1970s, many Caribbean Basin countries enacted legislation that created the conditions for the establishment of export-oriented assembly operations in their territories. They established the facilities in urban areas, near an international port and/or airport. The locations took advantage of existing transportation infrastructure to import machinery and materials for assembly and the export of finished goods. Examples of early EPZ of the enclave type in the region include La Romana in the Dominican Republic (established in 1969), San Bartolo in El Salvador (1974), and Puerto Cortés in Honduras (1974); Haiti, Costa Rica, and Guatemala meanwhile enacted legislation extending customs and investment incentives to export-oriented plants irrespective of where they were located in the nation. In December 1978, the Chinese Communist Party adopted a set of comprehensive economic reforms generally known as “Socialism with Chinese Characteristics.” A key component was the opening of the economy to foreign trade and investment. Initially, the policy vis-a-vis foreign direct investment (FDI) was limited to a readiness to welcome Sino-foreign joint ventures, with an emphasis on factories established by overseas Chinese and foreign citizens of Chinese origin.4 A very significant development in the implementation of the opening to foreign investment was the decision by the Chinese government in 1980 to establish four Special Economic Zones (SEZ) in Shenzhen, Zhuhai, Shantou and Xiamen in Guangdong and Fujian provinces.5 The objective of the SEZs was to: (1) attract foreign capital; (2) introduce advanced technology and management expertise; and (3) pilot market-oriented reforms in preparation for implementing the reform and opening up program nationwide. The four areas were chosen as laboratories for China’s foreign economic opening because of their proximity to Hong Kong, Macao, Taiwan and Southeast Asia and their anticipated ability to serve as a channel to attract overseas Chinese capital into China. be subject to the specific incentives set out in the authorization for investment issued by the Executive Committee of the Council of Ministers. Pérez Villanueva further states that in 1999, there were 120 operators in the Wajay zone, 91 in Berroa and 32 in Mariel and that the top five countries of origin for zone operators were Spain (62), Panama (43), Italy (33), Canada (13) and Mexico (13). He points out that the very high number of operators from Panama suggests that they were probably engaged in commercial activities, a field in which Panamanian companies that have operated in the free trade zones in their own country had gathered experience. 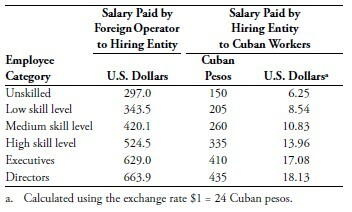 To Willmore’s point, the extreme differences between salaries received by Cuban workers employed by foreign companies operating in Cuba and the amount those companies pay to the hiring entity for the workers’ services are illustrated in Table 1. 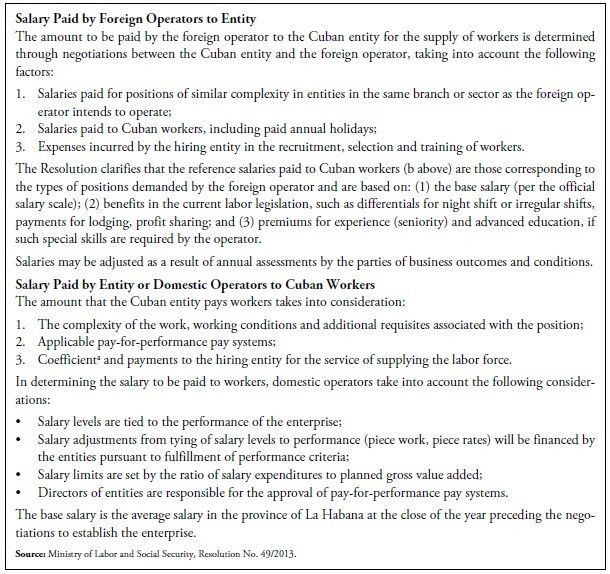 The information underlying the table originates from an undated study of over 24,000 workers subject to these salary arrangements (in joint ventures, subsidiaries of foreign companies, enterprises in free trade zones) conducted by a researcher on behalf of the Economic and Commercial Office of the Spanish Embassy in La Habana25 and do not refer to ZDEM workers. Take, for example, an unskilled worker: the Cuban hiring entity paid this worker 150 pesos or $6.25 per month, while the hiring entity received $265 per month from the foreign operator for his or her services, so that the worker received roughly 4.2% of the dollar amount paid by the foreign operator and the hiring entity realized 95.8%. For other categories of workers, the shares of the amount paid by the operator to the worker and to the hiring entity were 2.5% and 97.5%, respectively, for low to high-skilled workers; and 2.7% and 97.3%, respectively, for executives and directors. News and statements about the construction of a shipping port at Mariel, including a large container terminal, and of the ZEDM tend to be conflated and are difficult to disentangle. In this section of the paper, we first trace the historical development of the Mariel shipping port and then focus on the ZEDM and its system of investment incentives. exemption from territorial contribution taxes, although subject to 0.5% tax on income for a zone maintenance and development (infrastructure) fund. a special labor regime for workers employed in the ZEDM (discussed in detail below). The statute establishing the ZEDM sets out that while operators who locate in the ZEDM may directly employ foreign non-resident persons to perform management or technical jobs (Article 32), employment of Cuban or foreign resident workers must be done through a Cuban government entity designated to carry out this function (Article 31).41 National labor and social security legislation is applicable to all enterprises operating in the ZEDM (Article 33). The operator (investor) and the designated Cuban entity are required to enter into a labor supply agreement that specifies, among other things, the number and skill set of workers to employed, the pay workers will earn, length of time of employment, provisions for the termination or “return” (devolución) of the worker to the hiring entity and substitution by another, and provisions for the revision of the agreement (Article 37). The regulations establish that the designated Cuban entity pays employees in Cuban pesos (Article 42). Special rules apply for the separation of workers, either by decision of the operator or by the worker’s choice. The operator may “return” (devolver) a Cuban worker to the designated Cuban entity if the operator deems that the worker’s performance does not meet job “exigencies,” that is, the worker does not perform adequately (Article 40), provided the designated Cuban entity is compensated pursuant to a schedule set out in the regulations (Article 41). Resolution No. 49/2013 of the Ministry of Labor and Social Security sets out the methodology whereby (1) the designated Cuban entity and the operator determine the salary level the operator will pay the entity for the Cuban workers; and (2) the designated Cuban entity sets the salary level for the Cuban workers.43 It is evident from Box 2 that the two labor compensation determinations, by design, are independent of each other. That is, the pay that a Cuban worker would receive is not related to what the foreign operator pays for his/her services and workers are insulated from favorable developments regarding compensation in the negotiation between the hiring entity and the operator. An additional issue that bears consideration is that while the negotiations between the designated Cuban entity and foreign operators result in payments in U.S. dollars or in convertible Cuban pesos (CUC), a domestic currency that can be exchanged for U.S. dollars, Cuban workers are paid in Cuban pesos (CUP), a domestic currency that is not freely exchangeable for U.S. dollars. The Cuban press has given the following example of the mechanics for determining ZEDM workers’ wages.48 Assume that the investor and the Cuban hiring entity have agreed that a certain job would be remunerated at the rate of $1,000 or 1000 CUC per month. Applying the 80%-20% split between the worker and the hiring entity, the worker would receive $800 or 800 CUC and the hiring entity $200 or 200 CUC. With a coefficient (exchange rate) of 10, this would mean that the Cuban worker would realize 8,000 CUC per month; the personal tax on an income of 8,000 CUP (5%) would be 400 CUP, for a net salary of 7,600 CUP. That is, out of the amount paid by the investor ($1000 or 1000 CUC, equivalent to 24,000 CUP at the current CUP/CUC exchange rate) the worker would receive 7,600 CUP or about 32%. Compared to the previous arrangements, ZEDM workers will realize a considerably higher percentage of the amount paid for their services by foreign companies, but the degree of state confiscation of worker salary is still very high at about 68%.49 First, the permanent 20% levy on salaries for services lent by the state hiring entity is unprecedented and excessive. State employment agencies around the world usually offer their services to local workers free of charge: their objective is to provide labor market information and intermediation services to better match labor demand and supply and their work is perceived as a public good. 50 When there is a charge to either workers or employers, it tends to be nominal and assessed only once or as needed, while the 20% rate accruing to the Cuban state hiring entity seems to be unrelat ed to the level of services performed and permanent. Combining the two adjustments and the individual tax rate, and again using the hypothetical Cuban worker for whom a foreign company pays $1,000 or 1000 CUC per month, this worker would realize $317 or 317 CUC, less than one-third of the amount the investor pays for his or her services, while the state retains over two-thirds. In CUP, the distribution of the 24,000 that the foreign investor pays for a worker is 7,600 CUP for the worker and 16,000 CUP for the state. Cuba has high expectations about attracting significant amounts of foreign investment into the ZEDM and into the economy at large in the coming years. In an interview on Cuban television about the newly-enactment foreign investment law in late March 2014, Minister for Foreign Trade and Investment Rodrigo Malmierca stated that Cuba needs to attract between $2 billion and $2.5 billion annually in order for the economy to grow at the 7% per annum rate planners have set as a target for the next few years. “If the economy does not grow at levels around 7%,” said Malmierca, “we are not going to be able to de velop. … We have to provide incentives in order for them [foreign investors] to come.” 52 How do incen tives offered by the ZEDM compare with those of fered by other locations competing for incoming for eign investment? Will the incentives be the bait for attracting foreign investment to the island? A cursory comparison of the financial incentives of fered by the ZEDM and by zones in other countries with which the ZEDM would compete for incoming investment does not reveal any individual incentive or combination of incentives that would give the ZEDM a decisive edge. 56 In fact, the ZEDM’s financial incentives may well fall short of those of potential competitors with respect to subsidized infrastructure for production facilities (factory shells or warehouses), relocation grants, R&D support, free land or land subsidies, soft loans and loan guarantees, among others. Also problematic for some responsible investors would be the ZEDM pay arrangements that allow the government to confiscate a large percentage (68%, as discussed above) of a worker’s earnings. But in addition to the concern about confiscation, it is not clear that the arrangements would necessarily mean lower wage costs for investors, as the rate investors pay the Cuban entity for Cuban workers is negotiated between the Cuban state and the investor, with the state holding monopoly power over the human resource input. As we understand it, the negotiated rates are not grounded on national wage rates. The Cuban government has high expectations that the ZEDM and the new foreign investment law will have a positive impact on incoming foreign investment. President Raúl Castro has referred to the ZDEM as “the most important endeavor (obra) be ing carried out in the nation.” 59 Cuba hopes that foreign investment in pharmaceuticals, value added services and high technology production and exports will locate in the ZEDM, boosting exports and creating good quality jobs for Cuban workers. It is not entirely clear, however, why Cuba expects the ZEDM to succeed when earlier efforts to create free trade zones and industrial parks ended in failure and there have not been radical changes in the economic and institutional environment that would justify a different outcome. The response to date from international investors to the ZEDM has been cautious. The ZEDM’s official website (www.zedmariel.com) is silent on the number or types of investment projects that have been consummated or are under discussion. The only in formation available — as is often the case with Cuban economic data — originates from press reports citing government officials. A review by World Bank economists of a set of 30 re cent empirical studies of the determinants of foreign direct investment in developing and transition economies revealed that the size and growth potential of the host market were significantly associated with in vestment inflows; so were institutional and regulatory quality — that is, investment climate — and trade openness. 66 Fiscal and other forms of investment in centives did not appear to be significant determi nants. As a paper presented at a World Bank Group workshop on the role of incentives in attracting in vestment put it, “Investment climate is the cake. In centives are the icing on the cake.” 67 The elusive in vestment climate will be the key to the success of the ZEDM. 1. The text of Law-Decree No. 313 and related decrees and resolutions were published in Gaceta Oficial, No. 26, Extraordinaria (September 23, 2013), pp. 205–235. The Law-Decree and regulations became effective on November 1, 2013. 2. “Cuba promotes Mariel Special Development Zone,” Cuba Contemporanea (November 6, 2013), http://www.cubacontemporanea. com/en/print7661. 3. The working definition of EPZs in this paragraph is taken from Gregory K. Schoepfle and Jorge F. Pérez-López, “Export Assembly Operations in Mexico and the Caribbean,” Journal of Interamerican Studies and World Affairs, 31:4 (Winter 1989), pp. 132–133. The discussion that follows about EPZs in the Caribbean region also draws from this source. See also, World Bank, “Export Processing Zones,” PREMNotes (December 1998). 4. Organization for Economic Cooperation and Development (OECD), OECD Investment Policy Review: China 2003: Progress and Reform Challenges (Paris: OECD, 2003), p. 30. 5. Major Investment Areas in China, a report compiled by the Department of Special Zones of the State Council Office for Economic Restructuring, P.R.C. (Beijing: China Intercontinental Press, 1999), p. 6. 6. See statistics in United Nations Conference on Trade and Development (UNCTAD), World Investment Report 1993 (Geneva, UNCTAD, 1993). 7. Organization for Economic Cooperation and Development, Trade, Employment and Labour Standards (Paris: OECD, 1996), p. 99, citing an unpublished report by P. Lloyd. 8. Employment and social policy in respect of export processing zones (EPZs), ILO Governing Body, 286th Session, March 2003, p. 2. 9. http://www.wepza.org/. Included are countries that hosted large zones (areas with a resident population, such as the Chinese SEZs or cities designated as hosts for FDI), small zones (typically smaller than 1000 hectares, with no resident population, although worker dormitories may be allowed; investors must locate within the zone to receive benefits); industry-specific zones (such as jewelry zones in India or offshore banking zones); and performance-specific zones (which can be established anywhere in a country provided they meet certain criteria, such as export targets, level of technology, size of investment). 11. World Bank, Special Economic Zones: Performance, Implications and Lessons Learned for Zone Development (Washington: World Bank, 2008), p. 7. 12. Capítulo XV, Del Régimen de Zonas Francas y de Parques Industriales, Ley No. 77/95. 13. Decreto-Ley de Zonas Francas y Parques Industriales (June 2, 1996), http://www.cuba.cu/negocios/DL165.htm. 14. “Cuba Opens First of Four Duty-Free Zones,” AP (May 6, 1997). A fourth duty-free zone, to be located near the port of Cienfuegos, in Cuba’s southern coast, was also announced, but there is no evidence that it was actually established. The regulations for the Mariel Free Zone were approved by the Council of Ministers on October 23, 1997 and published in the Gaceta Oficial on November 13, 1997. 17. Omar Everleny Pérez Villanueva, “ La inversión extranjera directa en Cuba. Peculiaridades,” 1999, http://www.nodo50.org/cubasigloXXI/ economia/villanueva2_300602.htm. 18. Paolo Spadoni, “The Current Situation of Foreign Investment in Cuba,” Cuba in Transition — Volume 14 (Washington: Association for the Study of the Cuban Economy, 2004), p. 133. 19. Omar Everleny Pérez Villanueva, “The Role of Foreign Direct Investment in Economic Development: The Cuban Experience,” in Jorge I. Domínguez, Omar Everleny Pérez Villanueva and Lorena Barberia, The Cuban Economy at the Start of the Twenty-First Century (Cambridge: Harvard University Press, 2004), p. 192. 20. Spadoni, “The Current Situation of Foreign Investment in Cuba,” p. 133. 21. Spadoni, “The Current Situation of Foreign Investment in Cuba,” p. 133. 22. Larry Willmore, “Export Processing Zones in Cuba,” in Archibald R.M. Ritter, editor, The Cuban Economy (Pittsburgh: University of Pittsburgh Press, 2004), p. 64. 23. Richard Feinberg, The Cuban Economy: What Roles for Foreign Investment? (Washington: The Brookings Institution, December 2012), p. 16. 24. Feinberg, The Cuban Economy, p. 17. 25. Gregorio Dávila Díaz, “El mercado laboral cubano para empresas extranjeras,” Embajada de España en Cuba, Oficina Económica y Social. I am grateful to José Alvarez for providing me with a copy of this report. See also José Alvarez, “Foreign Investment in Socialist Cuba: Uncertain Real Profits for Foreign Capital and Continued Exploitation of the Labor Force,” Foundation for Human Rights in Cuba (May 1, 2014). 26. “Dubai Ports studies building Cuba container terminal,” Reuters (October 19, 2007); “Bye-Bye Embargo?,” The Economist (November 22, 2007); Wilfredo Cancio, “Mariel se convertirá en moderna terminal,” El Nuevo Herald (November 30, 2007). DP World’s interest in the port of Mariel stemmed from its acquisition in March 2006 of British corporation Peninsular & Oriental Steam Navigation Company (P&O). Since the 1920s, P&O operated cruise and ferry services between Cuba and Florida ports until they were terminated in the 1960s. P&O reportedly had a long-term interest in modernizing the port of Mariel. In November 2000, the international press reported that a consortium of firms representing the ports of Rotterdam and Moerdijk in the Netherlands and Willstead in Curacao and the Dutch metal trader Fondel International B.V. was negotiating a joint venture with Cuban authorities to develop the port of Mariel. See “Dutch Metals Group Looks to Cuba Port Development,” Reuters (November 4, 2000). 27. Although the exceptionally favorable financial deal from Brazil might have been the deciding factor, arguably relations with the United States — and more specifically concerns that might arise in the U.S. should the port of Mariel be built and managed by a Dubai company — might have also played a role. In 2006, DP World was involved in a national security controversy in the United States. By virtue of its purchase of P&O, DP World had acquired management of facilities at six major U.S. seaports (New York, New Jersey, Philadelphia, Baltimore, New Orleans and Miami) and sixteen others. The issue at hand was whether the fact that the government of Dubai in the United Arab Emirates owned DP World threatened U.S. national security. To address the concerns, after long and complex negotiations, a deal was struck in early 2007 whereby DP World sold the management of its U.S. port facilities to a U.S. entity, American International Group (AIG). See “AIG, DP World Reach Deal with Agency on Port Sale,” Bloomberg News (16 February 2007). Although DP World was one of the bidders, the Cuban government selected Singaporean company PSA International to manage the Port of Mariel. See Marc Frank, “Cuba bids to lure foreign investment with new port and trade zone,” Reuters (25 September 2013). 29. Jeff Franks, “Brazil to help finance Cuban port project,” Reuters (July 9, 2009). 30. Larry Luxner, “Brazil’s Odebrecht revives Mariel port,” CubaNews (March 1, 2010). Quality Couriers International S.A. seems to be a subsidiary of Almacenes Universales, which in turn is associated with Grupo GAESA, a conglomerate of enterprises owned and operated by the Cuban Armed Forces. See Polina Martínez Shvietsova, “The Two Mariels: Mega-Port and Ghetto,” Cubanet, May 21, 2014. 31. Fernando Ravsberg, “Brasil y Cuba multiplican sus relaciones económicas,” Carta desde Cuba (September 17, 2012). 32. “Odebrecht Infrastructure-Latin America Finalizes Revitalization of Mariel Port,” Odebrecht press release (January 27, 2014). 33. “Brazil: BNDES finances Cuban Port of Mariel”; “ZED Mariel generó 156,000 empleos en Brasil,” Opciones (January 27, 2014). 35. “Cuba: Inauguran primera fase del Puerto de Mariel,” Granma (January 27, 2014); Mimi Whitefield, “First phase of Cuba’s Mariel port update opens,” Miami Herald (January 27, 2014). 36. “Dilma: Puerto de Mariel, símbolo de nuestra amistad duradera,” Granma (January 27, 2014). 37. “New Cuban container terminal handles 57 ships in six months,” EFE (9 July 2014). 38. VI Congreso del Partido Comunista de Cuba, Lineamientos de la Política Económica y Social del Partido y la Revolución (April 2011), http://www.cubadebate.cu/wp-content/uploads/2011/05/folleto-lineamientos-vi-cong.pdf. The guideline in question is no. 103. The content of this guideline did not change during the debate of the draft guidelines that occurred in late 2010 and early 2011 initially among the population and then among Cuban Communist Party members. See VI Congreso del Partido Comunista de Cuba, Información sobre el resultado del debate sobre los Lineamientos de la Política Económica y Social del Partido y la Revolución (May 2011), http://www.cubadebate.cu/wp-content/uploads/2011/05/tabloide_debate_lineamientos.pdf. 39. Resolución No. 85/2013, www.mfp.cu/docs/aranceles/comerciales/ac_r_85_213.pdf. 41. According to the website of the ZEDM, www.zedmariel.com, as of July 2014, there were 12 “designated” employment entities, namely, Agencia Almacenes Universales S.A. del Grupo de Administración Empresarial; Grupo Grupo de las Industrias Biotecnológica y Farmacéutica BIOCUBAFARMA; Empresa Empleadora del Ministerio de la Construcción; Empresa Comercializadora de Servicios Técnicos y Tecnológicos TECNOSIME del Ministerio de Industrias; Empresa de Servicios de Ingeniería Eléctrica Cubana S.A. (SIECSA); Empresa de Preparación y Suministro de Fuerza de Trabajo de CUBAPETROLEO (PETROEMPLEO); Empresa Empleadora del Ministerio de la Agricultura (CUBATABACO); Empresa de Servicios Especializados del Ministerio de Comunicaciones (DELTA); Empresa Empleadora del Minsterio de Turismo (TUREMPLEO); Empresa Empleadora del Ministerio de Transporte (AGEMPORT); Corporación CUBARON S.A. de la Industria Alimentaria; and Inversiones GAMMA S.A. del Ministerio de Ciencia, Tecnología y Medio Ambiente. This is a departure from prior practice, whereby a single entity, ACOREC S.A. (Agencia de Contratación a Representaciones Comerciales), and to a lesser extent Cubalse S.A. (Cuba al Servicio del Extranjero), fulfilled this role. Cubalse was dissolved in May 2009 and its functions distributed to other government entities, with employment agency functions transferred to Palacio de Convenciones (PALCO). See Andrea Rodríguez, “Disuelven la corporación estatal Cubalse,” AP (June 3, 2009) and “El gobierno desmantela la corporación Cubalse,” Cuba Encuentro (June 3, 2009). 42. Consejo de Ministros, Decreto No. 316, Gaceta Oficial (September 23, 2013). 43. The Resolution implements Articles 39 and 44 of the ZEDM regulations issued by the Council of Ministers described above. 44. “Queda definido impuesto para personal de Zona Especial Mariel,” Cuba Debate (May 8, 2014). 45. Ministerio de Finanzas y Precios, Resolución No. 139/2014, Gaceta Oficial (May 7, 2014). 46. “Régimen de contratación en Zona Especial de Mariel beneficia a trabajadores,” Cuba Debate (14 April 2014). 47. “Régimen de contratación en Zona Especial de Mariel”; “Cuba anuncia reglas salariales para empleados de la Zona Franca del Mariel,” El Nuevo Herald (10 May 2014); and Ministerio de Trabajo y Seguridad Social, Resolución No. 14/2014, Gaceta Oficial (7 May 2014). 48. René Tamayo, “Definen impuesto sobre ingresos personales para trabajadores contratados,” Juventud Rebelde (7 May 2014). 49. Pérez posits that this is probably the highest personal income tax rate in the world. See Lorenzo L. Pérez, “Cuba: Assessment of the New Tax Law of 2012,” Cuba in Transition — Volume 24 (Washington: Association for the Study of the Cuban Economy, 2014). 50. This point is well made by Marlene Azor Hernández, “Los nuevos parásitos estatales,” Cuba Encuentro (23 April 2014). 51. Dimas Castellanos, “Los salarios de Mariel: una buena y muchas malas,” Diario de Cuba (24 April 2014). 52. Daniel Trotta, “Cuba approves law aimed at attracting foreign investment,” Reuters (29 March 2014). 54. Foreign Direct Investment in Latin America and the Caribbean 2010, p. 84. 55. Jamie K. McCallum, Export processing zones: Comparative data from China, Honduras, Nicaragua and South Africa, Industrial and Employment Department, Working Paper no. 21 (Geneva: International Labour Office, March 2011), pp. 1–2. 56. For example, under its Free Trade Zone Regime, the Dominican Republic offers exemptions from all taxes, duties, charges and fees for production and export activities in the zones for a period of 25 years for entities located near the Dominican-Haitian border and 15 years for those located in the remaining parts of the country; Guatemala offers an exemption from income tax for 12 years; and El Salvador does the same for 15 years. See Latin American Tax Handbook (Amsterdam: IBDF, 2010). 59. Leticia Martínez Hernández and Yaima Puig Meneses, “ZED Mariel: Es la obra más importante que se está haciendo en el país,” Trabajadores (March 9, 2014). 60. “Más de 70 firmas de Europa, Brasil y China interesadas en megapuerto cubano,” www.mercosurabc.com (February 21, 2014). 62. “Zona de Desarrollo del Mariel se apresta a recibir unas 15 inversiones internacionales,” Cuba Debate (April 11, 2014). 63. Yudy Castro Morales, “First projects investors could settle in Mariel before closing 2014,” Cuba Contemporanea (June 18, 2014). 64. Marc Frank, “Cuba struggles to attract investment despite reforms,” Reuters (August 21, 2014). 66. Kusi Hornberger, Joseph Battat and Peter Kusek, “Attracting FDI: How Much Does Investment Climate Matter?,” Viewpoint, no. 327, Financial and Private Sector Vice Presidency, The World Bank (August 2011).